You can find a piece of Hershey’s Chocolate with almonds almost anywhere. The delicious pairing makes for the perfect treat! Karen Ocamb, a supply quality auditor for Hershey’s, is working to make sure the relationship between the almond industry and her company remains sustainable and beneficial. After visiting the Almond Board Conference in Sacramento, Ocamb reported the good things the board is doing to make the partnership a success. “My perspective of the Almond Board is a really good, beneficial kind of facility that takes the almonds and gives us a better perspective of what should be done out there,” she explained. Ocamb also knows the importance of maintaining a healthy relationship between Hershey’s and the almond industry, particularly on the consumer’s behalf. Her goal is to ensure that the communication between the two stay open, in order to keep improving the quality of product for the customer. “Almonds are a great source of protein, so for the company, blending the chocolate and the almonds together is an essential piece of giving something to the consumer that is beneficial to them, but also sweet,” she said. The vision and the overall business model of the almond industry in California are looking very strong. Richard Waycott, president and CEO of the Almond Board of California, expanded on these strengths in a recent interview with California Ag Today. “One way that the almond industry has achieved success is the fact that we are very resource rich, and the Almond Board of California is blessed by very strong support financially and strategically for the industry,” Waycott said. “We have the ability to work on very serious projects and programs for California agriculture and because of our size, just over 1.3 million acres, we can have a tremendous impact on the ecology of the state, on environmental practices, on ag practices that can then obviously be disseminated and taken advantage of by other California agriculture,” Waycott explained. Waycott said the almond industry’s role is to produce this wonderful food product for human consumption. “The hulls and shells [are used] for other purposes, and we’re working very hard on that to determine new applications for those co-products, but then again to use the financial and the talent and treasurer of the industry and the size of the industry to innovate more rapidly and provide for constructive change,” Waycott explained. Excellent business practices is a part of the Almond Board of California’s mission. The Almond Conference was held recently in Sacramento, and growers and pest control advisors heard lots of news from forward-thinking industry leaders. 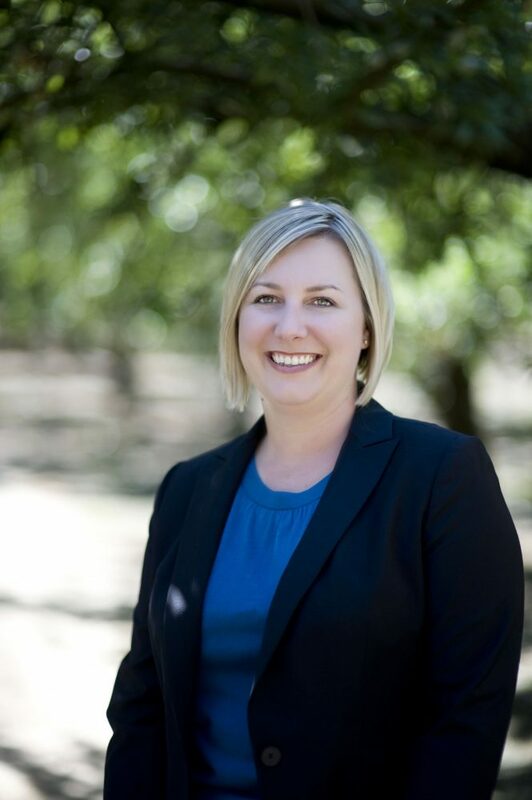 Stacey Humble is Vice President of Global Marketing and Communications for the Almond Board of California, which hosts the annual event. She told California Ag Today that extra big crops are coming. “You know, we have a dramatic increase in production coming online – about 500 million pounds. So, in terms of marketing, we need to make sure that we are utilizing all the resources that we have to their maximum benefit and that we’re reflecting on lessons learned in synergies and opportunities that we can take from one market to the next,” Humble said. The Almond Board is looking at how they can strengthen sales in new markets as well as existing markets. A good example of possible increasing sales is the big European market, such as Germany. They are the biggest importer of almonds, but consumers there do not eat them as a nutritious snack. Several hundred food activists attended the First Annual Farm Tank Summit in Sacramento last week, hosted by Food Tank, in partnership with the Visit Sacramento, California Farm-to-Fork Program, and University of California, Davis. Danielle Nierenberg, co-founder and president of Food Tank noted having the event in Sacramento enabled West Coast agricultural experts to contribute to the discussion. “We were really excited to feature California agriculture, because it’s such a huge part of the American economy,” said Nierenberg. “Californians are feeding the world, and we need to really highlight what these amazing producers are doing. When the Farm to Fork program of the Visitors Bureau reached out to us, we were thrilled to partner with such an amazing group of people, as well as UC Davis folks and the Center for Land-Based Learning,” she said. Food Tank, an abbreviation of Food Think Tank, is a 501(c)3 non profit organization focused on building a global community for safe, healthy, nourished eaters that values education, inspiration and change. Nierenberg clarified, “I don’t necessarily think we need to scale up food production; I think we need to scale out different innovations that are working. We’re wasting about 1.3 billion tons of food annually. That’s enough to feed everyone who’s hungry today, so we don’t necessarily need to ramp up production. We need to have better distribution, and processing practices that can help get food to people who need it the most,” she said. “We need the political will behind those things,” she continued, “to build the infrastructure necessary for farmers to have better processing facilities, to have better storage facilities, to have better roads—if we’re talking about the developing world. I don’t necessarily think that we need to invest in producing more calories; we need better calories. We need more nutrient-dense food, and we need less starchy staple crops,” she noted. Regarding farms and processing facilities, big is bad, and small is good. Regarding food quality, organic produce is healthy and safe, while conventional produce is unsafe and full of pesticides. Purcell answered, “We are an Ag company. Why would our company invest a million dollars on technology and let everyone have it? It is our investment and we need to have the opportunity for a return on that investment. Maloney also talked about agricultural Integrated Pest Management (IPM) technology such as smart sprayers that spray only targeted areas. This two-day event featured more than 35 speakers from the food and agriculture field, interactive panels moderated by top food journalists, networking, and delicious food, followed by a day of hands-on activities and opportunities for attendees. This was the second in a series of three 2016 Summits, following the Washington, D.C. Food Tank Summit that completely sold out and drew in more than 30,100 livestream viewers. The third Summit will be held in Chicago on November 16, 2016. Leadership was the recurring theme for the 3,000+ attendees over the three-day 43rd Annual Almond Conference, hosted by the Almond Board of California last week in Sacramento. “We are focused on the fact that the almond industry is accepting its responsibility to provide leadership for California agriculture and to use our treasure and talent to work on solutions for a lot of the problems that are very daunting,” said Richard Waycott, president and CEO of the Almond Board. “We have talked a lot about what is expected by consumers and by consumer product goods companies, which is our customer base,” Waycott noted. Water Management and Efficiency – A focus on accelerating almond farmer transition to more efficient irrigation scheduling and management practices to maximize the most crop per drop of water. This initiative, which builds on the 33 percent reduction in water used per pound of almonds achieved by the industry over the last 20 years, includes working with farmers to fine tune irrigation techniques and adopting more advanced water management technologies. Sustainable Water Resources – First, an exploration of how to best leverage a unique strength of the California Almond industry—its acreage—to accelerate natural flood-year groundwater recharge of aquifers. Collectively, California’s aquifers are the state’s largest water storage system; water recharged through this program would benefit all Californians, not just farmers. Second, an investigation of opportunities to recycle water from multiple sources, such as municipal wastewater, as a way of increasing overall water availability for farmers and all Californians. Air Quality – Investigation of various methods the almond industry can help meet the Central Valley’s exacting air quality standards. This initiative will scrutinize all components of almond farming that impact air quality and evaluate opportunities to decrease emissions. This initiative will identify alternatives, such as decreased fossil fuel use, that will result in cleaner air for all those who live in California’s Central Valley—farmers, their families, and surrounding communities. 22nd Century Agronomics – A recognition that we need to better understand and then adopt the technologies that will lead California farming into the 22nd century. The Almond Board of California will lead a comprehensive exploration of almond farming techniques, bringing an exploratory mindset to consider all options as to what innovations and technical “leap frogs” will be needed to sustainably farm in the future. Each component of almond farming will be considered, from land preparation and varietal development, to equipment and processing.